If you are looking for a place for your next tropical island vacation, you might like to consider Sabah Malaysia. Sabah is well known as a tropical paradise since this place is blessed with the abundance of nature's wonders. It is located on the third largest island in the world with tropical climate and is gifted with abundance of excellent tropical beaches that can make your dream vacation a reality. Sabah beaches covers best beach resorts and these white sandy beaches and the crystal clear sea water are one of the major tourist attractions. Not forgetting the fact that they are also sanctuaries to some of the best turtle island borneo as well! It is indeed the best place for a tropical island vacation! Tanjung Aru beach is undoubtedly one of major tourist attraction and one of the top chosen location for tropical island vacation in Kota Kinabalu, Sabah. 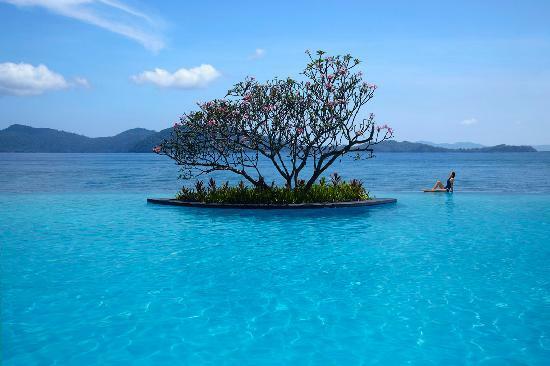 It is easy to reach there since it is only 6 km from Kota Kinabalu town centre and only about 10km from the airport. The Tanjung Aru beach is also home to Shangri-la's Tanjung Aru Resort, the Kinabalu Golf Club and the Kinabalu Yacht Club etc. The Pulau Lankayan is a very small tropical coral resort island in the Sulu Sea which is located in the northwest of the island of Borneo, in the state of Sabah. This island is well known for its peaceful endless white sandy beaches, casuarina trees, beautiful sunsets, many species of attractive flora and fauna and much more - absolutely perfect for a tropical island vacation! The Pulau Sipadan has fabulous sandy beaches with a densely wooded central core; it is located off the small coastal town of Semporna on Sabah's eastern coast. It is best known for diving and also the winner of many tourism and diving awards. This island is also known for having more than 3000 species of fish and corals that live in its ecosystem. Sipadan is an island like no other. 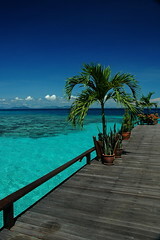 Planning a tropical island vacation to a Sabah island soon? Don't miss out on this exquisite island! 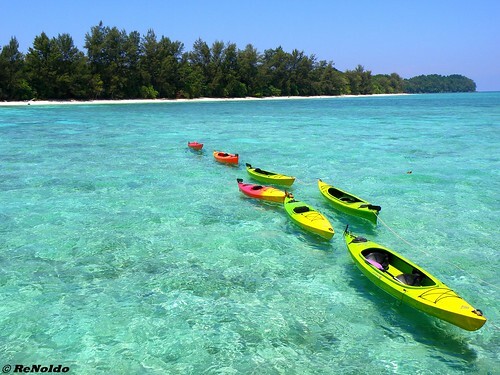 The Pulau Layang-Layang is a beautiful island situated 300 km north of the coast of Sabah. Its named after swallows and it is actually man-made. The Layang-Layang Island Resort is the only place to stay on the island and operates between the months of March and August. This beautiful island located in sabah island is home to thousands of migratory birds, a haven to large pelagic fish such as grey reef sharks, white-tip reef sharks, hammerheads as well as large schools of barracudas and mackerels and many turtles. Those craving for peaceful holiday will adore this place, as it is located faraway from civilization with beautiful views of the surrounding sea. The Pulau Mataking is situated towards the north of Mabul and Sipadan island and it consists of two islands, Mataking Kecil and Mataking Besar. The beautiful beaches of this island are really appealing - making it one of the best tropical island vacation destination. Various kinds of activities are available for adults as well as children, making it a perfect destination for family holiday. You can enjoy wide variety of activities here starting from island hopping, snorkelling trips, deep sea fishing, jungle trekking with an experienced guide, beach volleyball and soccer, sunning on the snow white sandy beach, seaweed and fish farm tours, traditional massage, fish feeding etc. The Pulau Mantani is a group of three remote islands located 80km northwest of Kota Belud, an hour’s drive from Kota Kinabalu. Its beaches are absolutely beautiful with incredibly white sand and crystal clear blue water. And it also attracts lots of tourists with its exciting diving opportunities. There are about 16 dive sites identified around the island and the marine life found here ranges from the tiny blue ringed octopus, seahorses, imperial shrimp, jawfish, lionfish, scorpion fish and lots more. 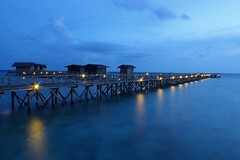 The Pulau Mabul or known as Mabul Island to most, is a small oval-shaped island covered by white sandy beaches. in past few years it has gained lot of popularity as a prime diving, snorkelling destination and the water isn’t very deep at 25-30 meters hence it makes it a suitable place for beginner divers. This island also offers variety of other activities depending on which resort you stay such as snorkelling, mountain biking, sea-kayaking and beach volleyball etc. Planning your Sabah vacation next? You would definitely want to include Mabul Island in your list! Alternatively, if you are looking to travel elsewhere, apart from Malaysia, you may perhaps like to consider Caribbean! Here's a wonderful site on Caribbean Vacation Planning : Complete Caribbean vacation planning guide with vacation and packing checklists, resort worksheets and destination information, incl. the southern Caribbean islands: Martinique, St. Bart’s, St. Martin, St. Kitts & Nevis, st. Lucia, Grenada and more. Are you a fan of the ‘Survivor’ reality series? If you are one, like I am, you most probably would have known about this island. Centuries old trees, perfect tropical climate and clean air induces one to relax and de-stress. What’s famous here is definitely its therapeutic natural volcanic mud – Your best excuse for a mud bath! This was form by the eruption of a volcanic eruption on the Philippine island of Mindanao in 1897. The last eruption happened in 1941 but warm mud continues to ooze on the island. Pom Pom Island is among the first few rare islands that was found on the South China Sea and is home to rich tropical vegetation. Surrounded by white sand and clear turquoise waters of the Celebes Sea, this lovely coral island offers all the possibilities of an astounding getaway! Home to the biggest marine park of Malaysia – Tun Sakaran Marine Park, this island is extremely rich with marine ecology and biodiversity and many more new macro species awaits to be named and discovered. Gaya island is named as the biggest island of Tunku Abdul Rahman Park and is nicely incorporated into the nature-rich environment of Sabah. The island has about six thousand floating population comprised majority of Bajau, Ubian and even Filipinos. Perhaps, the first impression for visitors when visiting this island is most likely the size that was covered by an abundant of lush pristine green landscape that resembles a mini rainforest. What’s best in Gaya Island is definitely its clear blue water given the number of private bays and secluded beaches, some of which, are untouched by mankind. Dinawan Island is a very private island located at the south of Kota Kinabalu. It has a perfectly unspoiled natural panorama and a picture perfect view of swaying coconut trees! Looking to escape from the hustle and bustle of city life? Looking for a getaway from the entire world? Dinawan Island would be the perfect pick for you! Snorkelling here is a splendid activity and you will be blown away by the beauty of the underwater marine lives of this little unknown tropical island vacation spot. 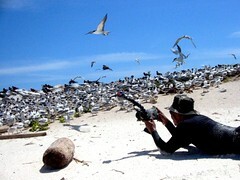 Kapalai Island is located only a few minutes away from the gorgeous Sipadan and beautiful Mabul Island. Here also lies the famous Sipadan-Kapalai Dive Resort which is a full sunny water village surrounded by only water, with no land in sight. Have you been day dreaming of taking a vacation in a place with clear blue sky, crystal pristine water and pictorial view of chalets located just above the sea? This island is probably the best choice for your tropical island vacation plans. Subscribe to this site, absolutely Free! I promise to use it only to send you Tour Bourneo Malaysia Tabloid. Site Sponsor space is available. Contact us here.